Coordinates: 23°10′58″N 75°46′38″E﻿ / ﻿23.182778, 75.777222 Ujjain (Hindi: उज्जैन) pronunciation ▶ (also known as Ujain, Ujjayini, Avanti, Avantikapuri), an ancient city of Malwa in central India on the eastern bank of the Kshipra River (part of the state of Madhya Pradesh, is the administrative center of Ujjain District and Ujjain Division. Ujjain has a lengthy history as a capital of the northern region. The epic Mahabharata speaks of Ujjayani as the capital of Avanti Kingdom during the ancient era, and Ashoka the Great (304 B.C.E.–232 B.C.E.) resided there. 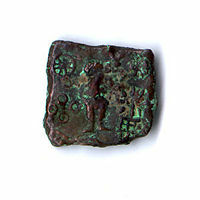 Ujjain served as the capital for King Chandragupta II (375-415 C.E. ), ruler of the Gupta empire. Ujjain has served as a center of science and culture in northern India. Since the fourth century B.C.E., it has served as the first meridian of longitude for Hindu geographers. During the rein of Chandragupta II, the nine poets known as the Navaratna (nine jewels) of Sanskrit literature assembled, inaugurating a golden age of Sanskrit literature. The city gave birth to mathematicians and astronomers during the sixth and seventh century who made enormous contributions to their fields. Ujjayani numbers among the seven sacred cities of the Hindus, with the Kumbh Mela religious festival held there every twelve years. Ujjain also serves as the home for Mahakaleshwar Jyotirlinga, one of the twelve Jyotirlinga shrines to the god Shiva. Other noteworthy temples in the city include Bade Ganeshji ka Mandir, Chintaman Ganesh Temple, Hara Siddhi Temple, Mangalnath Temple, and Pir Matsyendranath. A number of palaces remain, including the Kaliadeh Palace. The earliest references to the city, as Ujjaini, come from the time of the Buddha, when it served as the capital of the Avanti Kingdom. Since the fourth century B.C.E., the city has marked the first meridian of longitude in Hindu geography. Ujjain is reputed to have been the residence of Ashoka (who subsequently became the emperor), when he presided as the viceroy of the western provinces of the Maurya empire. In the Post-Mauryan period, the Sungas and the Satavahanas ruled the city consecutively. 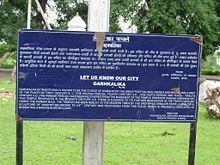 The Satavahanas and the Ror Sakas (devotees of Shakumbari), known as Western Satraps contested for control of the city for a period. Following the end of the Satavahana dynasty, the Rors city retained Ujjain the from the second to the twelfth century C.E. Following the rise of the Gupta dynasty, the city soon became an important seat in the annals of that empire. Ujjain became the traditional capital of King Chandragupta II, also known as Vikramaditya, at whose court the nine poets known as the Navaratna (nine jewels) of Sanskrit literature inaugurated a golden age of Sanskrit literature. In the sixth and seventh centuries, Ujjain became a major center of mathematical and astronomical research. Famous mathematicians who worked there included: Brahmagupta, whose book Brahmasphutasiddhanta spread the use of zero, negative numbers and the positional number system to Arabia and Cambodia; Varahamihira, the first to discover many trigonometric identities; and Bhaskaracharya, or Bhaskara II, whose book Lilavati broke new ground in many areas of mathematics. The Delhi Sultanate led by Iltutmish invaded Ujjain in 1235, bringing widespread destruction and systematic desecration of temples. Under the Mughal emperor Akbar it became the capital of Malwa. During the last half of the eighteenth century, Ujjain served as the headquarters of the Maratha leader Sindhia. The Scindias later established themselves at Gwalior, and Ujjain remained part of Gwalior state until Indian Independence in 1947. Gwalior state became a princely state of the British Raj after the Maratha defeat in the Third Anglo-Maratha War, and Gwalior, Ujjain, and the neighboring princely states became part of the Central India Agency. After Indian independence, the Scindia ruler of Gwalior acceded to the Indian Union, and Ujjain became part of the Madhya Bharat state. 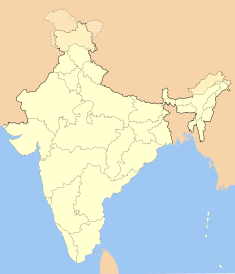 In 1956, Madhya Bharat merged into the Madhya Pradesh state. Following is a description of temples and historical sites in Ujjain. Mahakaleshwar Jyotirlinga is a famous Hindu temple dedicated to Lord Shiva, one of the twelve Jyotirlingams, the sacred abodes of Shiva. A three-story temple, on the Rudra Sagar side of the lake. The main deity, Shiva in the lingam form is believed to be swayambhu (born of itself), deriving currents of power (Shakti) from within itself as against the other images and lingams which are ritually established and invested with mantra-shakti. The idol of Mahakaleshwar is known to be dakshinamurti, facing the South. That is a unique feature, upheld by tantric tradition found only in Mahakaleshwar among the twelve jyotirlingas. The idol of Omkareshwar Shiva is consecrated in the sanctum above the Mahakal shrine. The images of Ganesh, Parvati, and Karttikeya have been installed in the west, north and east of the sanctum sanctorum. To the south resides the image of Nandi. The idol of Nagchandreshwar on the third story is open for darśana or reverenced viewing only on the day of Nag Panchami. The temple has five levels, one underground, located in a spacious courtyard surrounded by massive walls near a lake. The shikhara or the spire is adorned with sculptural finery. Brass lamps light the way to the underground sanctum. Situated above the tank near the Mahakaleshwar Temple, Bade Ganeshji ka Mandir contains a gigantic artistic sculpture of Ganesha, the son of Shiva, of rare beauty and size. An idol of the panch-mukhi (five-faced) Hanuman adorns the middle of the temple. Classes for learning of Sanskrit and Astrology are offered in the temple. Chintaman means "the assurer of freedom from worldly anxieties." Built across the Shipra (Kshipra) river on the Fatehabad railway line, Chintaman Ganesh temple houses a Ganesh idol supposed swayambhu or born of itself. Riddhi and Siddhi, the consorts of Ganesha, sit on either side of Ganesha. The temple, considered ancient, has artistically carved pillars in the assembly hall date back to the Paramara period. The temple sits about fifteen kilometers from the center of Ujjain. Occupying a special place in the galaxy of ancient sacred spots of Ujjain, Hara Siddhi Temple has been dedicated to Annapurna. Seated between the idols Mahalakshami and Mahasaraswati, the Annapurna has been painted with a dark vermilion color. The Shri Yatra, the symbol of power or shakti, also stands enshrined in the temple. According to Shiva Purana, when Shiva carried away the burning body of Sati from the sacrificial fire, her elbow dropped at this place. An interesting legend in the Skanda Purana relates the manner in which the Goddess Chandi acquired the epithet of Harassiddhi. Once when Shiva and Parvati rested alone on mount Kailasha, two demons called Chanda and Prachanda tried to force their way in. Shiva called upon Chandi (Parvati) to destroy them, which she did. Pleased Shiva bestowed upon her the epithet of Harasiddhi means "one who vanquishes all." The temple, reconstructed during the Maratha period, has two pillars adorned with lamps, embodying special features of Maratha art. An ancient well sits on the premises, and an artistic pillar adorns the top of it. The worship of the eight Bhairavas forms a part of Saivite tradition, Kala Bhairava the chief among them. King Bhadrasen has been credited with building the Kal Bhairava temple on the banks of the Shipra. Mentioned in the Avanti Khanda of the Skanda Purana, Kal Bhairava temple has been important for the Tantric Kapalika and Aghora sects, of which Ujjain stood as a prominent center. Beautiful paintings in the Malwa style once decorated the temple walls, of which only traces remain visible. The nearby village of Bhairogarh, famous for its printing, takes its name from the temple. The Mangalnath temple has been dedicated for worship to Shiva or Mahadeva. Situated away from the bustle of the city, it overlooks a vast expanse of the Kshipra River. Regarded as the birth place of Mars (mangala in Hindi), according to the Matsya Purana, the temple has a clear view of the planet and hence has proven well-suited for astronomical studies. Constructed by Bayajibai Shinde, the queen of Maharajah Daulat Rao Shinde, in the nineteenth century. The door in the inner sanctum may have been carried to Ghazni from the Somnath temple, and from thence by Mahmud Shah Abdali to Lahore, from where Mahadji Scindia rescued. This temple, located on a beautiful spot on the banks of Shipra River, quite close to the Bhartrihari Caves and the Gadkalika temple, has been dedicated to a leader of the Natha sect of Shaivism-Matsyendranath. Muslims also venerate Pir Matsyendranath. Excavations have yielded artifacts dating to the sixth and seventh century B.C.E. Navagraha Mandir (Triveni)—A temple dedicated to the nine planets. Features an enormous banyan tree on the banks of the Shipra, considered sacred since the medieval ages. This banyan tree has the same significance as akshayavata in Prayag and Gaya, Vanshivata of Vrindavan and Panchavata of Nasik. Thousands of people emerse in the Shipra River from the bathing ghats built on site. According to one tradition, Parvati performed her penance here. Followers of the Natha sect previously worshipped here. The little village of Bhairogarh near Siddhawat has gained fame for its tie-and-die printing for centuries. In ancient times, when the trade with other counties flourished, exquisitely printed cloth from Bhairogarh found their way to Rome and China. Bhartrihari, the step brother of Vikramaditya, may have lived and meditated here after renouncing worldly life. He may have written his famous works, Shringarshataka, Vairagyashataka, and Nitishataka, here. Situated on the banks of Shipra River, Kaliadeh Palace is a beautiful ancient site. A majestic Sun temple formerly stood at this site. The Avanti-mahatmya of Skanda Purana has recorded a description of the Sun temple and two tanks, the Surya Kunda and the Brahma Kunda. Remains of old temple are scattered all around. A fragmented inscription records the building of the palace in 1458 C.E., in the time of Mahmud Khilji. The central dome of the palace presents a beautiful example of Persian architecture. Two Persian inscriptions record the visits of Akbar and Jehangir to the palace. The Pindaris destroyed the palace, Madhav Rao Scindia restoring it in 1920. As early as the Mahabharata period, Ujjain enjoyed the reputation as a great seat of learning. According to Puranic traditions, Krishna and Sudama received their education in the Ashrama of Guru Sandipani. The area near the ashrama, known as ankapata, has been popularly believed the place where Lord Krishna washed his writing tablet. Guru Sandipani engraved the numerals 1 to 100 found on a stone. The Gomti Kunda, referred to in the Puranas, had been the source of water supply to the ashrama during the ancient period. An image of Nandi, belonging to the Shunga period, may be found near the tank. The followers of the Vallabha sect regard that place as the 73rd seat of the 84 seats of Vallabhacharya where he delivered his discourses throughout India. Durgadas fought for the independence of Jodhpur after the death of Maharaja Jaswant Singh and helped Ajit Singh to ascend the throne against the wishes of Aurangzeb. Durgadas died at Rampura in 1718, his funeral rites performed according to his wishes on the banks of Shipra River. The rulers of Jodhpur built the Chatri in Rajpur style of architecture as memorial to Durgadas. A statue of Durgadas standing within the temple has crumbled. Situated about two miles from Ujjain, Kalidasa worshipped the deity in Gadkalika. According to legend, he had been an idiot. His devotion to the goddess Kalika helped he acquire great literary skill. Because Kalidasa frequented the temple, Harshavardhan in the seventh century C.E. and again during the Paramara period. The temple has been rebuilt in the recent times by the Gwalior State. Vedhashala—An observatory built by Raja Jai Singh II (1686-1743), located at 23°10′16.5″N 75°46′0″E﻿ / ﻿23.17125, 75.76667. Still in use, Vedhashala numbers among the five he built (the others include the Yantra mandir (Jaipur) and the Yantra Mandir (Delhi). ↑ Vincent A. Smith, The Early History of India from 600 B.C.E. to the Muhammadan Conquest Including the Invasion of Alexander the Great (Oxford: Clarendon Press, 1914), 325. ↑ Dirk Jan Struik, A Concise History of Mathematics (New York: Dover Publications, 1987), 66. ↑ G. S. Chhabra, Advanced Study in the History of Modern India (New Delhi: Sterling Publishers, 1971), 302. ↑ Kenneth William Morgan, The Religion of the Hindus (Delhi: Motilal Banarsidass, 1987), 189. ↑ Indian ET Zone, Harsiddhi Durga Temple, Ujjain, Madhya Pradesh. Retrieved January 21, 2009. Chhabra, G. S. 1971. Advanced Study in the History of Modern India. New Delhi: Sterling Publishers. OCLC 247623. Morgan, Kenneth William. 1987. The Religion of the Hindus. Delhi: Motilal Banarsidass. ISBN 9788120803879. Room, Adrian. 1997. Placenames of the World: Origins and Meanings of the Names for over 5000 Natural Features, Countries, Capitals, Territories, Cities and Historic Sites. Jefferson, NC: McFarland. ISBN 9780786401727. Scholastic Library Publishing. 2005. Encyclopedia Americana. Danbury Conn: Scholastic Library Pub. ISBN 9780717201389. Smith, Vincent A. 1914. The Early History of India from 600 B.C.E. to the Muhammadan Conquest Including the Invasion of Alexander the Great. Oxford: Clarendon Press. OCLC 174877753. Struik, Dirk Jan. 1987. A Concise History of Mathematics. New York: Dover Publications. ISBN 9780486602554. This page was last modified on 5 January 2016, at 17:12.